Item # 315096 Stash Points: 395 (?) This is the number of points you get in The Zumiez Stash for purchasing this item. Stash points are redeemable for exclusive rewards only available to Zumiez Stash members. To redeem your points check out the rewards catalog on thestash.zumiez.com. Brand yourself a dominant one with the Cut Above sticker from Dark Seas. 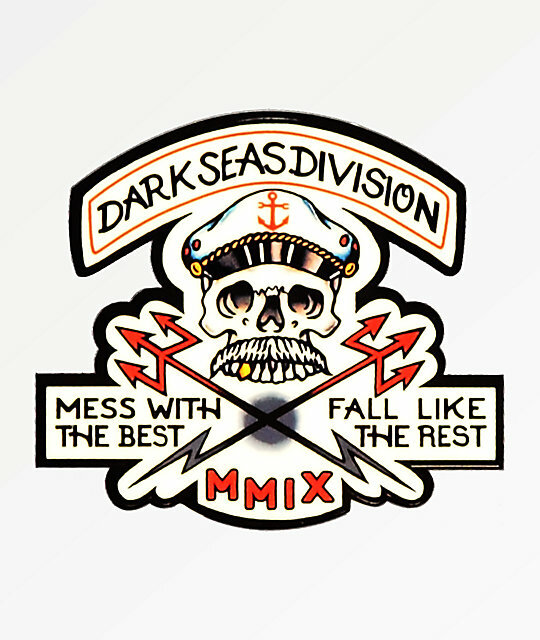 A skeleton with a mustache and sailor's hat on has two crossing tridents below him with "Mess with the best, fall like the rest" text surrounding. Cut Above from Dark Seas. Skull with crossing tridents graphic.